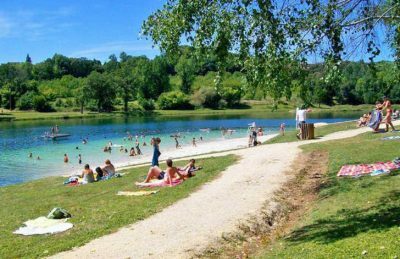 Campsite le Repaire is a small, family friendly campsite that lies within 8 hectares of wooded grounds on the outskirts of Thiviers, a stones throw from Perigueux. The campsite is in a beautiful part of the countryside in a location that lends itself to peace and relaxation which is something that you’ll definitely be able to find here. Well maintained and perfectly located pitches ensure that your stay is an enjoyable one with plenty of space and shade available to escape the warm summer sun. Thiviers is a little over 2km away and is an extremely pretty town having remained relatively unchanged for a number of years. There are a number of interesting and old buildings within the town along with all the necessities you’ll need whilst on holiday. Thiviers is also well known for the production of foie gras and there’s even a museum that tells visitors all about its production. At the heart of Campsite le Repaire is it’s brilliant range of water activities. Firstly, the campsite boasts a good swimming pool for it’s size that includes a coverable pool and toddlers pool with a variety of seating and sunbathing areas. Secondly, you’ll find a lovely little lake which is for fishing and there’s also a pedalo. Finally just a short walk away, around 800m from the campsite, you’ll find Etang de Nantheuil. A fantastic lake on which you can fish, canoe, use pedal boats and there’s also a beach area, grass sunbathing area and it is great for swimming and relaxing. Campsite le Repaire is a small campsite that still manages to offer a good range of on site activities and facilities. On site activities at Campsite le Repaire include table tennis, tennis court, boules, cycle hire, fishing and a playground. Facilities available at Campsite le Repaire include WIFI, snack bar, takeaway, bar, fresh bread, animation team, games room, tv room, washers and dryers. Accommodation at Campsite le Repaire campsite includes a range of 2 and 3 bedroom mobile homes that are available from Suncamp. You can also book camping pitches for your own tent, mobile home or caravan at Campsite le Repaire.